Did you know that your iOS device can act as the brain of a robot? Romotive engineers Phu Nguyen and Peter Seid invented a smartphone-powered Android – the Romo 3. As soon as you dock your iDevice in its dedicated port, you can immediately train and utilize it as your digital pet or companion. For this entry, we’ll give you our full review of this innovative technology from Romotive. The dock looks like a tiny bulldozer with a blue LED light on its body and a pair of rubberized threads on both sides. Using a dedicated iOS application, your handset’s screen will serve as its face. You’ll be greeted by a cute blue creature with two rounded eyes, a mouth, and teeth. It also displays different types of emotions: smile, wink, frown, and sad. It utilizes the front camera in order to recognize its master. After a series of training, it will start following you around your house and act as a digital pet. It can even run with with a blazing speed of up to 1.1 ft/s or 0.34 m/s on hardwood floors or tiles. The previous models (Romo 1 and 2) only support iDevices having a 30-pin connector such as the iPod Touch 4, iPhone 4, and 4s. In their third model, they plan to target new users of iPhones with 9-pin lightning connectors. The investors demonstrated an actual prototype which is fully compatible with the iPhone 5, 5c, 5s, and iPod Touch 5th generation.If you’re a little bit curious about the difference of the latest iDevice to its predecessors, go to the compare iPhone section of http://www.o2.co.uk/iphone/iphone-5s. A Wi-Fi or cellular data connection is required in order to remotely control and manipulate your digital toy through another iDevice. Setting up Romo for the very first time isn’t a difficult task. You are only required to create a user account upon launching the application. This profile will be used to link your other iDevices with the robot. To give it a more personal look, you can actually show yourself using the remote iDevice to replace the animated blue face. It’s even possible to control even if you’re on the other side of the planet, so long as you have a reliable internet connection. Interacting with this responsive machine is fun and entertaining. You can touch the screen to tickle Romo and see how he reacts. Using the front camera, the dock can also tilt and follow your movement in 15, 45,and 90 degrees angle to interact with you even if you are standing. Using another iDevice, you can view its real-time point-of-view and control the robot to tour you around your vicinity. You can also take remote pictures of the place using your gadget’s front and rear snapper. However, if you lose your internet connection, you can’t summon the machine back to your location. You don’t have to be an expert to train the Android. It only uses your mobile camera to learn and understand you as its master. When you move a little bit closer to it, it will learn to move a little bit backwards. It’ll also mirror your facial emotion. There are also regular updates for its iOS application;adding new modules, language cards, and functionalities.The machine costs $149. Although it looks like just a toy, it’s actually suitable for all ages, especially those who are fond of robotics. 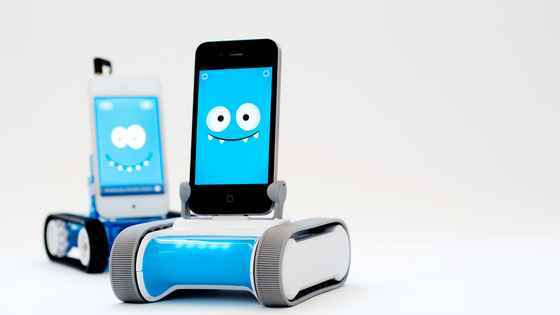 What do you think of this iOS-powered robot? Share your insights with us and subscribe to our website to read DIY series, workshops, and feature stories regarding high-tech machines. [! [myMINIavy](https://2016.robotix.in/img/blog/2013/12/myMINIavy.jpg)](https://2016.robotix.in/img/blog/2013/12/myMINIavy.jpg) **About the Author** Jennifer Birch is a regular tech contributor for [Techie Doodlers](http://techiedoodlers.com/). As a self-confessed geek, she’s absolutely enthusiastic with robotics. In fact, she collects high-end toys of fictional robot characters such as R2-D2, Mega Man, and RoboCop. Catch her blurbs and random tweets here: [@WrittenByJenni](https://twitter.com/WrittenByJenni).